Shane Long scored his 16th goal of the season to boost Reading's play-off hopes with victory over Millwall. The home side took an early lead when Long's cross was half-cleared to Hunt, who chested down and drilled home. Neil Harris came on for the Lions at half-time and within a minute he volleyed Nadjim Abdo's chipped through ball into the far corner. But Long won it for the Royals, drilling in superbly from the edge of the box after a swinging cross by Hunt. The result gives Reading their first Championship win in six, while Millwall - now with only one win in five - drop to 11th. It took the hosts only three minutes to seize the advantage, Long's industrious run leading to a cross which made its way to Hunt, who applied a cool finish. The visitors sounded their first warning soon after when former Reading man James Henry's right-footed corner found Tamika Mkandawire in space, but the imposing defender's header comfortably cleared the bar. It was not long before Henry was causing problems again for his old side with another set-piece delivery into the heart of the box which the Royals struggled to clear. Hamer Bouazza stole possession but his subsequent shot could not find a path through the crowded penalty area. Shaun Cummings then missed a glorious chance to double the hosts' lead just before the break when he blazed over from close range following good set-up play from Jobi McAnuff. 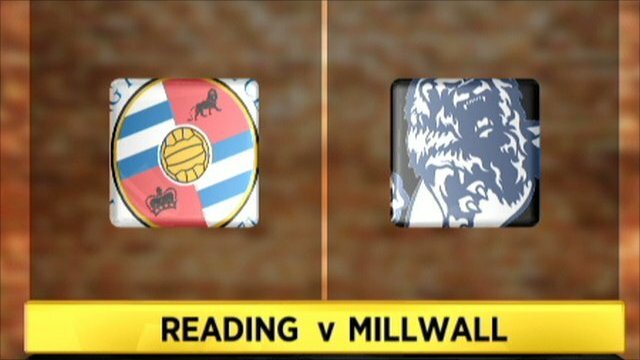 The Lions were giving as good as they got but were almost punished for a lapse in concentration when McAnuff slipped in Andy Griffin down the flank, only for his cross to be taken by Millwall goalkeeper David Forde with a host of Reading players looking to pounce. Harris was introduced at the break and it took him only 30 seconds to make an impact. Abdou clipped the ball through for the veteran striker to volley across goal and into the far corner. The 33-year-old put an end to his run of 16 games without a goal when he netted against Middlesbrough at the weekend, and he was back in the thick of the action again moments later when Griffin had to get in a last-ditch block to deny him from close range. But with Millwall beginning to enjoy the ascendancy, Reading hit them with a swift counter-attack to reclaim the lead. Hunt swung in the cross and Long showed superb composure to drill it home from the edge of the box. Millwall continued to press for the equaliser, but Harris was frustrated by an offside flag when he appeared to be through on goal. Top scorer Steve Morison continued to assert his authority on the home side's defence with some good hold-up play but his lay-off for Liam Trotter proved wayward. 90:00+5:32 The referee blows for the end of the match. 90:00+4:38 Free kick awarded for a foul by Tamika Mkandawire on Jay Tabb. Matt Mills takes the free kick. 90:00+3:57 Shane Long has an effort at goal from outside the penalty box missing to the wide right of the goal. 90:00+2:50 Free kick awarded for an unfair challenge on Tamika Mkandawire by Andy Griffin. David Forde takes the indirect free kick. 90:00+1:18 Booking Andy Griffin goes into the referee's book for time wasting. 90:00+0:01 Alan Dunne challenges Jobi McAnuff unfairly and gives away a free kick. Andy Griffin takes the indirect free kick. 86:47 Neil Harris is ruled offside. Indirect free kick taken by Alex McCarthy. 86:19 Mikele Leigertwood takes a shot. David Forde makes a save. 86:06 Jimmy Kebe decides to take a short corner. 85:45 Shaun Cummings takes a shot. Tony Craig gets a block in. 85:05 Tamika Mkandawire challenges Shane Long unfairly and gives away a free kick. Free kick taken by Mikele Leigertwood. 85:05 Booking Tamika Mkandawire shown a yellow card. 84:35 Tony Craig produces a cross, clearance made by Ivar Ingimarsson. 82:36 The offside flag is raised against Shane Long. David Forde restarts play with the free kick. 81:52 James Henry produces a right-footed shot from just outside the area that goes harmlessly over the target. 80:55 The ball is delivered by Tony Craig, Header at goal by Steve Morison, save by Alex McCarthy. 79:47 Substitution Noel Hunt leaves the field to be replaced by Simon Church. 79:29 The ball is sent over by Neil Harris, blocked by Shaun Cummings. 78:32 Jimmy Kebe crosses the ball, Paul Robinson manages to make a clearance. 77:10 The assistant referee flags for offside against Steve Morison. Indirect free kick taken by Matt Mills. 76:42 The referee blows for offside. Free kick taken by Alex McCarthy. Correction - 76:01 Noel Hunt challenges James Henry unfairly and gives away a free kick. James Henry takes the free kick. 76:01 Free kick awarded for a foul by Noel Hunt on James Henry. Free kick taken by James Henry. 74:10 Substitution Darren Purse joins the action as a substitute, replacing Nadjim Abdou. 73:51 Free kick awarded for an unfair challenge on Alan Dunne by Andy Griffin. Indirect free kick taken by David Forde. 71:17 Liam Trotter challenges Andy Griffin unfairly and gives away a free kick. Alex McCarthy takes the free kick. 70:49 Andy Griffin takes a shot. Blocked by Paul Robinson. 68:45 The assistant referee signals for offside against Shane Long. Indirect free kick taken by David Forde. 67:10 The assistant referee signals for offside against Liam Trotter. Free kick taken by Alex McCarthy. 65:58 Booking Jimmy Kebe shown a yellow card. 65:12 Unfair challenge on Shaun Cummings by James Henry results in a free kick. Alex McCarthy takes the indirect free kick. 64:35 Shane Long gives away a free kick for an unfair challenge on Tony Craig. David Forde takes the indirect free kick. 63:10 Chris Hackett produces a cross, clearance made by Matt Mills. 62:13 Substitution Tony Craig on for Scott Barron. 60:08 Free kick awarded for a foul by Steve Morison on Ivar Ingimarsson. Alex McCarthy takes the indirect free kick. 59:42 Free kick awarded for a foul by Alan Dunne on Shaun Cummings. Free kick taken by Alex McCarthy. 58:59 Corner from the left by-line taken by James Henry, Mikele Leigertwood manages to make a clearance. 57:11 Jay Tabb gives away a free kick for an unfair challenge on Alan Dunne. David Forde restarts play with the free kick. 57:02 The ball is swung over by Jimmy Kebe, clearance made by Alan Dunne. 54:52 Assist on the goal came from Noel Hunt. 54:52 GOAL - Shane Long:Reading 2 - 1 Millwall Shane Long fires in a goal from the edge of the area to the bottom right corner of the goal. Reading 2-1 Millwall. 54:21 Jobi McAnuff fouled by Alan Dunne, the ref awards a free kick. Indirect free kick taken by Andy Griffin. 53:15 The ball is sent over by Steve Morison, save by Alex McCarthy. 52:33 Inswinging corner taken left-footed by Jay Tabb from the right by-line, save by David Forde. 52:19 The ball is swung over by Shane Long, blocked by Tamika Mkandawire. 51:23 Free kick awarded for a foul by Paul Robinson on Alex McCarthy. Alex McCarthy restarts play with the free kick. 51:12 Outswinging corner taken from the right by-line by James Henry, save made by Alex McCarthy. 48:16 Neil Harris takes a shot. Blocked by Andy Griffin. 47:42 The offside flag is raised against Shane Long. David Forde takes the free kick. 46:47 Inswinging corner taken right-footed by Jay Tabb from the left by-line, clearance by Paul Robinson. 45:15 GOAL - Neil Harris:Reading 1 - 1 Millwall Neil Harris gets on the score sheet with a goal from the edge of the area to the bottom right corner of the goal. Reading 1-1 Millwall. 45:01 Substitution Neil Harris is brought on as a substitute for Hameur Bouazza. 45:00+1:25 James Henry takes a shot. Comfortable save by Alex McCarthy. 45:00+0:56 The ball is swung over by Andy Griffin. 42:29 The ball is crossed by Jimmy Kebe, blocked by Chris Hackett. 41:44 Inswinging corner taken by Jobi McAnuff, David Forde makes a save. 41:36 The ball is swung over by Jobi McAnuff, clearance by Paul Robinson. 40:08 Shaun Cummings produces a left-footed shot from inside the area that goes over the bar. 39:04 Free kick awarded for a foul by Alan Dunne on Jobi McAnuff. Andy Griffin takes the indirect free kick. 38:17 Free kick awarded for an unfair challenge on Chris Hackett by Jay Tabb. David Forde restarts play with the free kick. 37:34 Free kick awarded for a foul by Paul Robinson on Shane Long. Andy Griffin restarts play with the free kick. 37:34 Booking The referee shows Paul Robinson a yellow card. 35:59 Paul Robinson concedes a free kick for a foul on Andy Griffin. Indirect free kick taken by Alex McCarthy. 34:35 The ball is swung over by Jay Tabb, Paul Robinson manages to make a clearance. 33:29 Effort on goal by Jay Tabb from deep inside the area goes harmlessly over the bar. 30:23 Inswinging corner taken by James Henry. 30:07 Corner taken by James Henry from the left by-line. 29:53 Centre by Steve Morison, blocked by Mikele Leigertwood. 29:10 Scott Barron delivers the ball, Headed effort from deep inside the penalty area by Steve Morison misses to the left of the goal. 28:20 Corner taken by Jobi McAnuff played to the near post, Steve Morison manages to make a clearance. 25:22 Free kick awarded for a foul by Nadjim Abdou on Shane Long. Jay Tabb takes the free kick. 24:17 Headed effort from inside the area by Steve Morison misses to the left of the goal. 23:45 Free kick awarded for a foul by Andy Griffin on Alan Dunne. Hameur Bouazza takes the direct free kick. 21:03 Outswinging corner taken right-footed by James Henry, clearance by Mikele Leigertwood. 20:16 Corner taken right-footed by James Henry, Steve Morison crosses the ball, Mikele Leigertwood manages to make a clearance. 19:14 The ball is crossed by James Henry, clearance by Shaun Cummings. 18:31 Andy Griffin concedes a free kick for a foul on James Henry. James Henry restarts play with the free kick. 17:45 Free kick awarded for an unfair challenge on Hameur Bouazza by Shaun Cummings. Free kick taken by Scott Barron. 16:52 Outswinging corner taken right-footed by James Henry played to the near post, Header on goal by Tamika Mkandawire from just inside the area goes over the goal. 16:42 James Henry delivers the ball, clearance made by Ivar Ingimarsson. 15:04 The ball is swung over by Jimmy Kebe, Mikele Leigertwood takes a shot. Save by David Forde. 14:55 Corner taken short by Jay Tabb. 14:39 The ball is delivered by Jimmy Kebe, Scott Barron manages to make a clearance. 14:29 Centre by Noel Hunt, Tamika Mkandawire manages to make a clearance. 12:08 Corner taken left-footed by Jay Tabb, Paul Robinson manages to make a clearance. 11:57 Centre by Jimmy Kebe, blocked by Scott Barron. 11:23 A cross is delivered by Jimmy Kebe, blocked by Scott Barron. 10:36 A cross is delivered by Scott Barron. 9:53 Jobi McAnuff takes a shot. Paul Robinson gets a block in. 8:42 Foul by Steve Morison on Ivar Ingimarsson, free kick awarded. Alex McCarthy restarts play with the free kick. 8:26 Mikele Leigertwood gives away a free kick for an unfair challenge on Liam Trotter. Free kick taken by David Forde. 5:17 James Henry is penalised for a handball. Indirect free kick taken by Mikele Leigertwood. 4:55 Jay Tabb decides to take a short corner. 4:29 Inswinging corner taken by Jay Tabb, Liam Trotter manages to make a clearance. 4:18 Jimmy Kebe crosses the ball, Paul Robinson makes a clearance. 2:47 Assist on the goal came from Shane Long. 2:47 GOAL - Noel Hunt:Reading 1 - 0 Millwall Noel Hunt fires in a goal from just inside the area to the bottom right corner of the goal. Reading 1-0 Millwall. 1:14 Jay Tabb takes a inswinging corner from the right by-line to the near post, save by David Forde.